Okay … I know it’s MOFO and this post doesn’t really have anything to do with food … but I couldn’t resist sharing this pic of two of my rescued animals. SCRUFFY is a Jack Russell Terrier Mix, as energetic and headstrong as you’d expect. Friends of ours found him wandering their neighborhood, skinny and scared, in a thunderstorm. We agreed to foster him while they searched for his old family – or found him a new one. While we were searching, Scruffy destroyed everything from dog toys to shoes to purses to Victoria’s Secret bras to leather sofas. When he wasn’t destroying things, he was chasing cats or looking for opportunities to escape. Finally we decided Scruffy was just too much a headstrong mess for anyone but ourselves to take care of. TIGER is an abused street kitten. His fairy godmother just happened to witness him being cruelly attacked by a middle school student, resulting in his chin being “degloved” from his jaw. Yes, it’s exactly what you’re picturing – only a bit worse. So the fairy godmother took him to her vet where, in addition to receiving reconstructive surgery on his chin, he was also treated for upper respiratory infection, ear mites, ear yeast infection, conjunctivitis, worms, and coccidia. In retrospect, being abused by that psychotic child probably saved his life! His fairy godmother couldn’t keep him because she already had a full house of animals, including a cat with a condition that could possibly be passed on to this kitten. So I volunteered to foster him. As soon as I saw his sweet little face and saw how super-affectionate he was, I wanted him for myself. Inveterate Cat Chaser as well as Mighty Toy Destroyer. My first orange cat, Charlie, was literally scared shitless by him. My second orange cat, Prince Harry, became buddies with him only after a standoff reminiscent of a showdown at the O.K. Corral. I was a little afraid Scruffy might think Tiger was just another fuzzy squeak toy and might try to chew the stuffing out of him. Surprise. 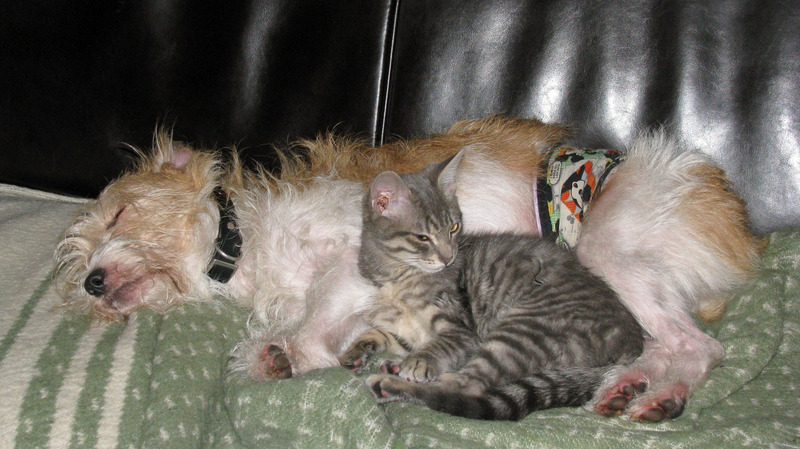 Scruffy took one look at Tiger and fell absolutely, utterly, and completely in love. He has appointed himself Tiger’s babysitter and follows him all day from room to room, watching over him. (This new job also means Scruff gets into a lot less trouble!) They also sleep together each night and nap together during the day. Wait a minute … I CAN turn this into a MOFO post! While neither of them eat a vegetarian diet, they both like vegan food! Scruffy has always been fond of veggies in general – when we first took him in, the only way we could get him to eat his food was to cover it with leftover spinach dip from a potluck! He also loves cornbread, veggie burgers, veggie sausages, and just about any form of lentils or rice & beans! Whilst we found Tiger on the table the other day, happily eating his way through a bowl of “cheezy” grits that was almost as big as he was. « Arsenic In Rice? What’s A Vegan To Do? They are both adorable! 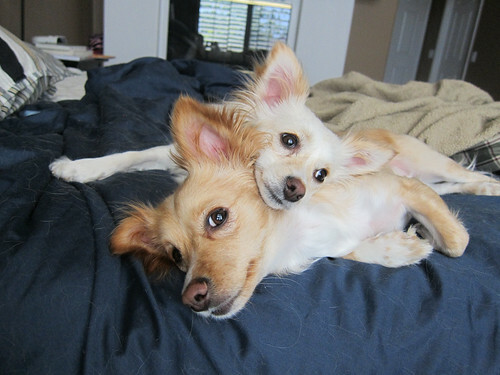 I have two rescued puppies, Teddy and Twinkle. My cat Strawberry who passed away a few years ago was also rescued. I wish to tell everyone: Don’t shop, ADOPT! Thank you! I agree, there are so many wonderful pets out there looking for homes! I’m enjoying your blog – maybe you could post pics of Teddy and Twinkle some day if you run low on food ideas! Oh they are so completely adorable!!!! What breed are they? We’re not too sure, but the rescue group told us they might be chihuahua and papillon mix.